To supplement the requirement of calcium & phosphorus for health & productivity. To replenish Calcium & Phosphorus passed out through milk. Unique formula for better Calcium absorption in the body leading to optimum milk production. To minimize the incidences of metabolic disorders. To meet higher requirement of Calcium during Gestation Period & Lactation Period. Herbal supplementation is helpful in strong built, increases quality & quantity of milk and improves breeding. Combination of Herbal formulation along with Ashawgandha and Stawri provides physical strength immunity and improves reproductive system. We can provide this diet as a healthy tonic to our pets like Cat, Dog, Horses for better health. For Poultry farms we can feed chicks for healthy health. For better absorption of HERBOCAL GOLD DIET in the body it is recommended to use with Herbovita Plus Diet. 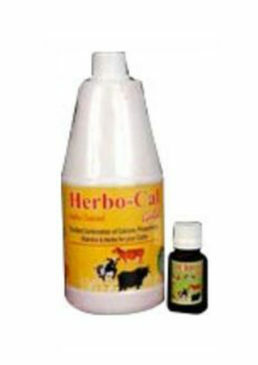 Recommended usage: For Cow, Buffalo & Horses , Calves/Dogs 50ml 2 to 3 times a day. Recommended usage : Cattle/Buffalo/Horses 2/3 tea spoonsful daily. Usage :More effective in milk yielding of cattle if given along with Herbocal Gold Diets Supplement.Also it is very important for better absorption of calcium and phosphorus.